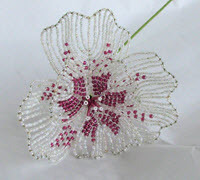 This is a very cool and unusual technique found on vintage beaded flowers and on beaded flowers made in China. The leaf is often found with a traditional French Beaded Flower and the flower may be seen with a frame leaf or a French Beaded leaf. I call it the frame technique because you first form the shape, i.e. frame, of the leaf or petal with 22-gauge wire. Bead rows are strung horizontally with each row on a separate 26-gauge wire. 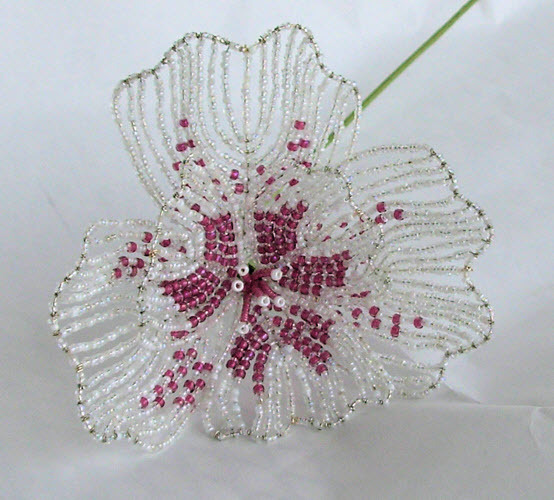 Detailed instructions including templates and bead counts are included for the leaf and flower in the picture. Templates are also included for 3 more leaves.